The size of the radiators you will need depends on the size of your room, the quality of its insulation and several other factors relating to your property type. You can use our simple radiator calculator to work out what total wattage you will need from your radiators to heat the room efficiently. Then all you have to do is choose a radiator or combination of radiators that adds up to the required wattage. You may find it more practical to choose a combination of smaller radiators rather than one large radiator because this can make it easier to make use of the available space – as well as creating a more even distribution of heat. Never-underspecify your heating: using smaller radiators than necessary will mean you may not be able to heat your room adequately, and your radiators will be overworked which will compromise their efficiency. Make sure you have enough space to fit your chosen radiators. We recommend carefully measuring your wall spaces and cross-checking with the dimensions of your intended radiators before making your purchase. How do you install wall mounted electric radiators? When it comes to installing our plug in radiators, nothing could be easier. Our electric radiators can be fitted quickly and easily with only the most basic of DIY skills. We provide everything you need to fix your new purchase securely to the wall. Once you are done, simply plug into a standard 13amp socket. If you prefer a more discrete fitting, you can pay an electrician to hardwire your radiators directly into the wall. How do you control wall mounted electric radiators? All the wall mounted electric radiators for sale at Electric Radiators Direct come with their own thermostats, temperature settings and programmable timers, making it possible to programme each room separately to fit within your daily schedule. With a thermostat accurate to within fractions of a degree and 24/7 hour by hour programming, you can truly control the heating in every part of your home. Perhaps you have an office or study which you don't use at the weekend, or maybe you only want to heat the bedroom for a couple of hours before you go to sleep? It could be that you work all day and only need heat in one or two rooms in the morning and in the evening – or maybe you work from home on a Wednesday and like a low level of heat throughout the day. Electric wall mounted radiators make it possible to adapt your heating schedule to your lifestyle, meaning you're constantly saving energy and wasting less money. Many households are dependent upon boiler powered gas central heating systems which offer limited controllability and are inherently susceptible to heat loss and energy wastage. When you factor in maintenance costs, the risk of burst or frozen water pipes and the inaccuracy of most central thermostats, gas central heating often works out as a time-consuming, disruptive and expensive option. For ultimate energy-efficiency, controllability and comfort tailored to your lifestyle, wall mounted electric radiators offer an exciting alternative to traditional gas central heating, storage heaters or conventional convection radiators, giving you levels of control never previously thought possible in domestic heating. Can you fit wall mounted radiators in conservatories? Yes. Electric radiators are very well suited to use in conservatories because they allow you to control the heating in your conservatory separate from the rest of your house – and you won’t need to pay to have your central heating plumbing extended. You can use any of our electric radiators in your conservatory, provided you have the space. If your conservatory has glass doors leading into the house it may be that you only have space on dwarf walls beneath your conservatory windows. If this is the case you might want to choose our Haverland RC12B Conservatory Electric Radiator; at only 38cm tall, but 102.5cm wide, it fits easily under most conservatory windows whilst providing plenty of heat to keep you cosy all year round. What is your slimmest wall mounted electric radiator? 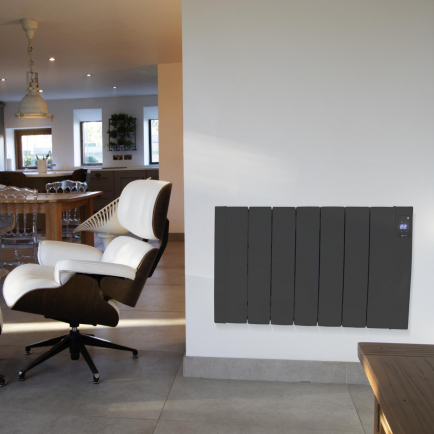 Choosing slimline electric radiators is a great way to maximise space in your home. The Haverland Designer RC Wave is our slimmest electric radiator, with a depth of only 7.4cm, an elegant design and fully enclosed aluminium heating elements. 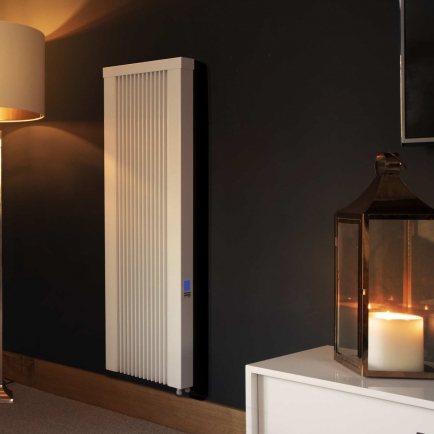 The Haverland Lodel is our slimmest electric panel heater radiator, with a depth of only 5.5cm. The Lodel heats by convection only, so it should not be used a primary heating source in your busiest rooms; however, it makes an excellent space-saving choice in spare rooms and home offices. Electric wall radiators provide an energy efficient, fully controllable heating solution that requires no maintenance and is suitable for DIY installation. They heat just like central heating radiators – but with none of the mess, fuss and expense! Available in a range of sizes you’ll find wall mounted electric radiators suitable for every room in your house – with specialised models for high ceilinged rooms and super-slim designs to help maximise space in your rooms. With free next working day delivery and DIY plug-in-and-go fitting, you can order today and enjoy energy efficient heating tomorrow.